So I came to the realisation today that I hadn't get showed off my latest haircut! I got it done the Saturday before Christmas and it's been a long time coming, so I thought I would show off the new do that everyone else seems to be going for too! Have you gone in for the chop too? What are we calling this style ladies because I don't know yet!? I always like a change in my hair. Normally we're talking colour or a sweeping fringe, but I retracted my pledge about cutting hair any shorter and went for the big trim! I'd been pinning a few haircuts on Pinterest throughout the month before, and I was always drawn back to this style. Eventually I bit the bullet and booked to get it cut a couple of days later! I just thought if I didn't like it I knew it'd always grow back (like last time), and well... YOLO! I've been loving the length and how easy it is to manage now in terms of dry time and styling. Agreeably, I can't get it in a plait, but I can still manage a top knot! I also love that it's just above my shoulders curly and just below straight, so it can do a hell of a lot with manipulating the length! 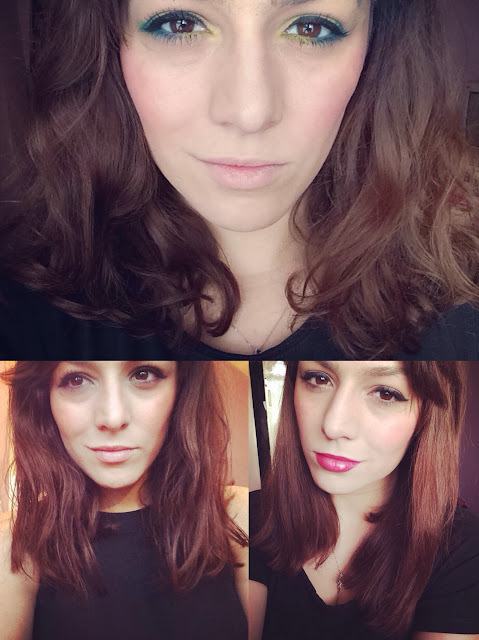 Its also a blunt cut rather than the layered look for a little edge at the moment, but that might be the next step, since I think these curls would look amazing with this length and layered! I've loved creating the 'beach hair' look with a little salt spray and alternatively curling it with my new Enrapture Totem Styler for something a little more natural and glamorous! I honestly didn't think I'd love it as much as I have, but I'll definitely be keeping this length a while! I'd like to say it suits me quite nicely! What do you think?